I'm officially back! Back in Spain, back online, back to daily life. But it feels different, I have to say. We've only been gone from Madrid for a month but somehow it feels like it's been much longer. There's changes all around me: a new 5 euro bill, my local Zara completely remodeled, and a Starbucks in the basement of our grocery store, and that's just the tip of the iceberg. Something internal has shifted as well, a settling of sorts, a coming to terms with change: the inevitability of it and the excitement of it. I don't want to sound melodramatic or anything, but we're nearing the end of a big era in our lives, and steadying ourselves for the one that lies ahead. A year from now I predict our lives will be totally different, new city, new jobs, new friends, new routines. And while it used to just terrify me, now I'm filled with energy and enthusiasm. I'm still nervous about it all, but it's more like pre-show jitters, lovely little anxious butterflies to carry me along the journey. Anyway, I don't usually wax philosophical on the blog, but I just couldn't help it. And to mark the change, I've bought some flowers for our home, something I rarely do. 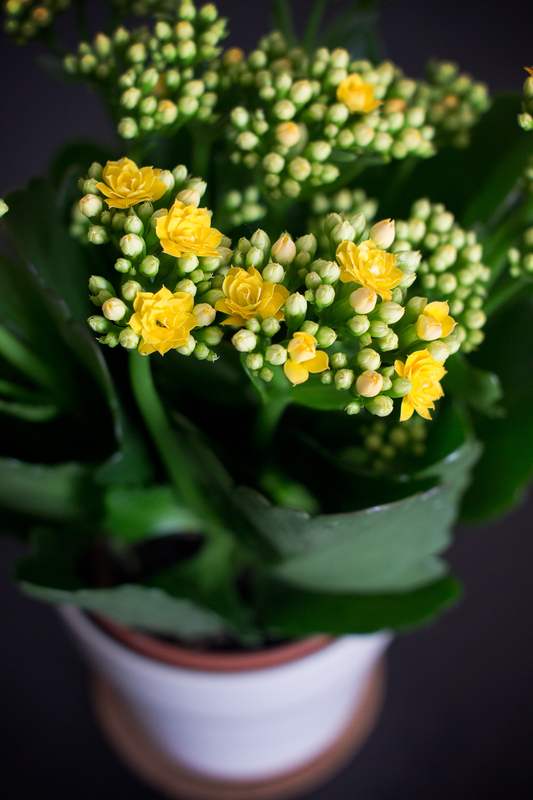 (Kalanchoe, which apparently can be spelled Kalanchoë or Kalanchöe, movable umlauts? Who ever heard of such a thing?) Hopefully I won't kill this little guy, cause it sure is making me happy. Here's to the start of (a new) something good! Welcome back! Lots of changes here too, so I know how you feel. Nice to have you back Defne and I hope you had a lovely break. It's funny how you can ring the changes which happen in just one month. If you had just stayed, you would have taken these things happening for granted. Are you going back to the US? I suppose the changes wouldn't seem so drastic if I'd been here all along, but really it does seem like an awful lot in a month. Just visited my butcher who's totally redone his shop, and there's a new health food store opened up by my dance studio as well. Spain usually does not move this fast, I swear! And yes, we are looking at heading back stateside, possibly in the next 6 months. We still have about a billion details to take care of though, so we're flexible on the timeline right now. Oh and thanks, it's good to be back! which really is a immature share of the problems a lot of people unrecorded with sect now, but but making improved lives for group that's direction on feat them much , keeping them punter aid and making certain their kids get enlightened.